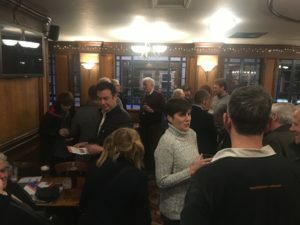 Another chance to meet-up reminisce from the campaign, discuss our Debate for Democracy, talk about the European Parliament elections, meet-up with old friends or make some new. We are holding our next Leavers of Croydon drinks from 7pm on Thursday 9th May at the Builders arms. Come along and meet other local leavers. The Croydon Constitutionalists are hosting a ‘Debate for Democracy’ of democracy honouring pro-Brexit parties in April. Representatives of the Democrats and Veterans Party, Foundation Party, Libertarian Party, SDP and UK Independence Party, will be setting out their agenda for a democratic Britain and taking part in the panel debate. The debate will be held upstairs at the Green Dragon, 60 High St, Croydon CR0 1NA from 7pm on the 18th April 2019. All parties are pro-Brexit and honouring the biggest vote in British history. Each speaker will be given 5 minutes to talk about their party and plans for Britain free from the EU. This is a great chance to see local representatives of parties that are growing as people are increasingly dissatisfied with the discredited politics of those in Westminster.